We are often asked, “What wine pairs best with turkey?” during the holidays. But the real truth of the matter…the turkey itself is the probably the least flavorful item on your Thanksgiving table. That’s right! The appetizers, the side dishes and your desserts (grandma’s favorite recipes) have most of the flavor. With that said, it is even more important to choose the correct wine (or wines) around those flavors. Wine pairing really begins at the door when your guests arrive. For this, I suggest a mulled wine. The aroma in itself is a true sensory experience, but it will also serve to warm your guests from the cold chill outside. It is enjoyed by all levels of wine drinkers and entices the senses as to what is yet to come. During the meal, I suggest a wine that is not too dry (for the newer wine drinkers) and not too sweet (for your seasoned wine connoisseurs). For this reason, I would recommend either our Riesling white or our Fryburg White wines. Both the Riesling and the Niagara grapes are well known for their all around flavor and beautifully ‘balanced bouquet’ wines. Neither will overpower your side dishes and provide a sensory with turkey that is sure to please. Last, but certainly not least, is the dessert. I recommend our Cranberry Mist after the meal. This flavorful wine has a tart finish that will pair perfectly with the pumpkin pie. It is great for sipping well into long family discussions or during a crazy game of charades. 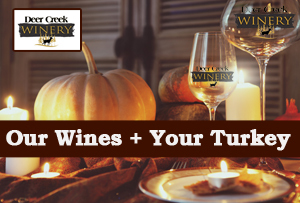 Pairing the perfect wine with your Thanksgiving dinner is as easy as knowing your wines. Stop by any of our winery locations and let our wine experts help you pair yours. Happy Thanksgiving!